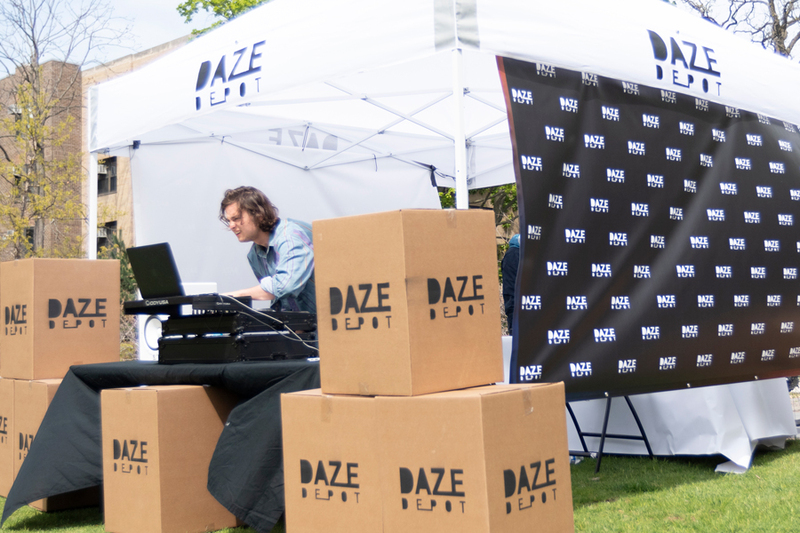 Daze Depot sets up in the fraternity quad. The Northwestern startup aims to provide summer storage at a more affordable price. Weinberg sophomore Nick Westfall started a mobile DJ company when he was a high school freshman. After coming to Northwestern and connecting with additional partners, he rebranded and relaunched Daze Productions, a company that owns its own audiovisual assets and offers full-scale production services, he said. Earlier this year, Westfall and Daze Enterprises decided to venture into the summer storage industry too, founding Daze Depot. The company is the third under the larger brand — a separate venture, Daze Consignment, deals with audiovisual asset management, liquidations and resale. Westfall said the team continues to integrate the values behind the name “Daze” — including transparency, execution and design — into their new ventures. “The idea (for Daze Depot) came about a month ago when we realized we have extra storage capacity where we store our equipment,” Westfall said. Westfall said the team takes pride in its commitment to quality. Daze Depot is only offering storage to 420 students this summer to ensure that it is able to protect students’ belongings and deliver the best service possible. Daze Depot also accommodates students who will be studying abroad in the fall and need storage for a longer period of time, Westfall said. Justin Adkins, sales and logistics operator at Daze, said he has been friends with Westfall since high school and joined Daze last summer after attending an entrepreneurship camp. “I realized that I really enjoy school, but I need to be doing something else. I was bored,” said, Adkins, who attends the University of Wisconsin-Milwaukee. After joining the group, Adkins said he and three others on the “core team” bought and transported all 105 speakers from Chesapeake Energy Arena in Oklahoma City to Chicago, liquidating the entire arena sound system in a matter of months as a Daze Consignment project. The company also picked up another large shipment of audiovisual equipment from Seattle last winter, liquidated half of it and kept the rest for Daze Productions. Westfall said the team’s experience with asset tracking through Daze Consignment makes Daze Depot a more secure option for summer storage. Will Noglows (Medill ’17), chief experience officer, said NU students should pay more attention to what summer storage services they use. After graduating from NU, Noglows spent the past 9 months working at ESPN before deciding to join Daze Productions. Adkins said he connected with Westfall because they are both passionate about producing events. The new storage company has been making its presence known by setting up sleek white booths accompanied by electronic tunes across campus. Westfall said Daze focuses on interacting with its customers through its minimalistic design and upbeat music.